Michael discussed how his seminar Digitizing Folk Music History puts the folk back in folksonomies. 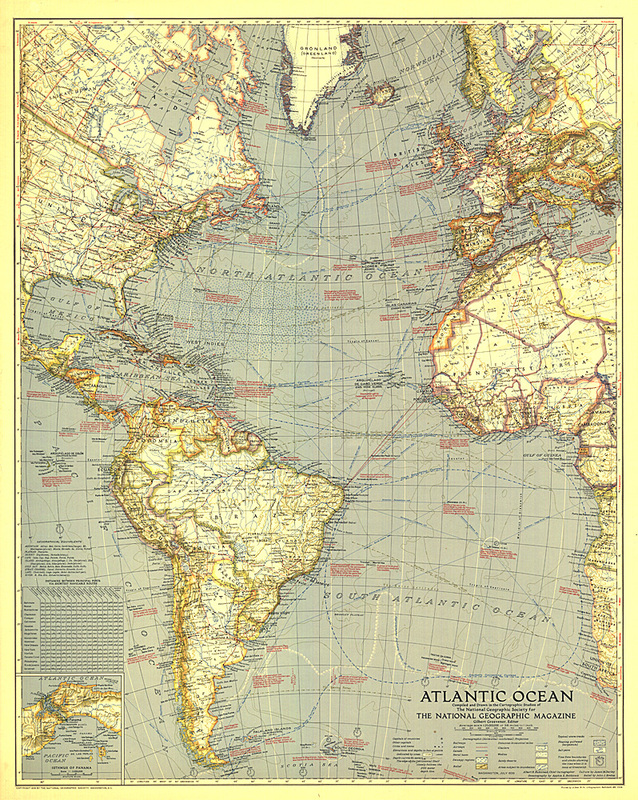 Jillana discussed her course Reimagining Imagining the Internet: Fiction, Film, and Theory. A number of regular NUDHL participants—Liz McCabe; Richard Lepine—also gave presentations about their pedagogical innovations. 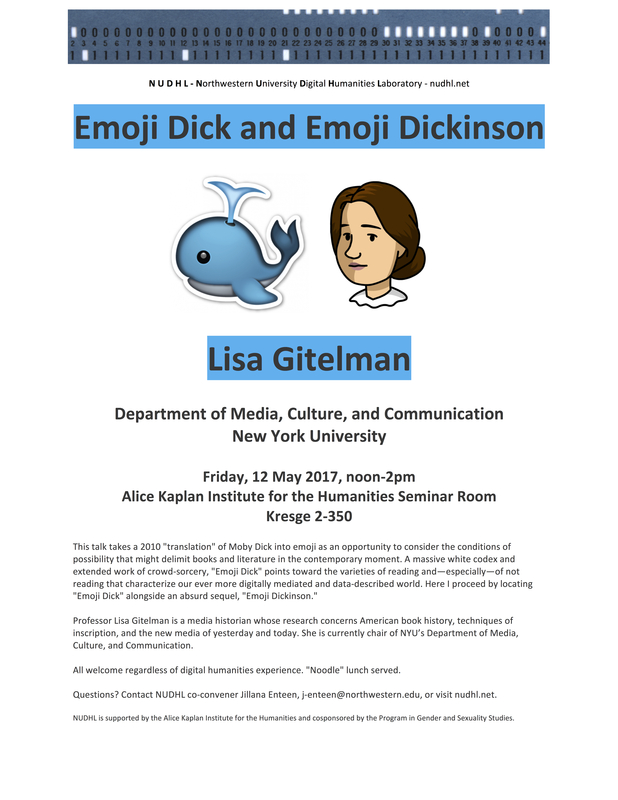 Professor Lisa Gitelman is a media historian whose research concerns American book history, techniques of inscription, and the new media of yesterday and today. She is currently chair of NYU’s Department of Media, Culture, and Communication. 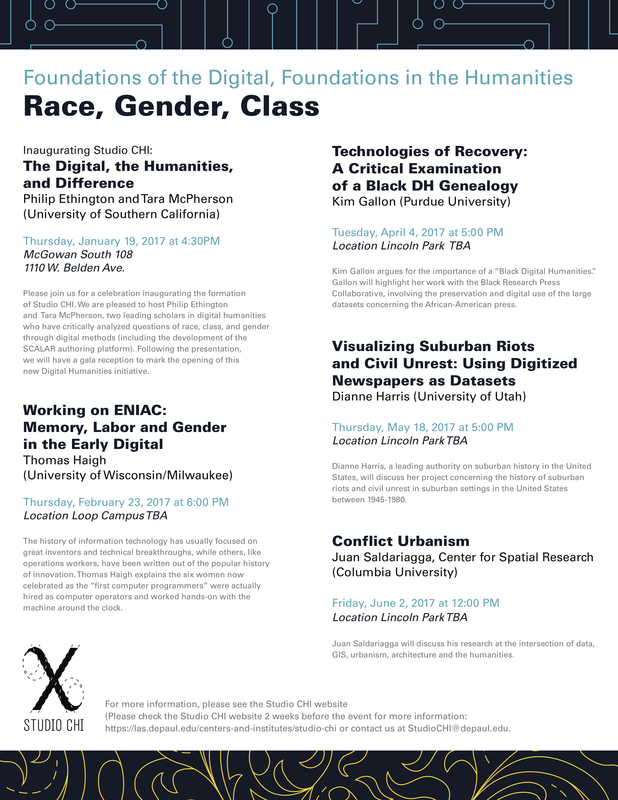 All welcome regardless of digital humanities experience. “Noodle” lunch served. Questions? Contact NUDHL co-convener Jillana Enteen, j-enteen@northwestern.edu, or visit nudhl.net. 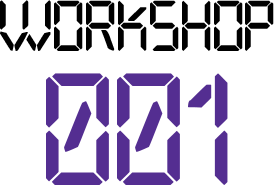 NUDHL is supported by the Alice Kaplan Institute for the Humanities and cosponsored by the Gender and Sexuality Studies Program. Two faculty members who participated in Northwestern’s Digital Humanities Summer Faculty Workshop offer an update on their digital pedagogy. Focusing on the radicalism of Spenser’s gender politics, the experimentality of his literary form, and the subversiveness of (some of!) his political agenda, Kasey Evans and her students explore Spenser’s supposed traditionalism through the potential transformations of a multimedia, interactive approach to his work. 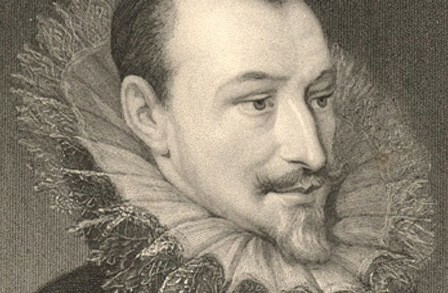 Can the “sage and serious Spenser,” as John Milton called him, be re-enlivened through the creation and curation of an online archive of texts, commentary, explication, illustrations, in short a digital “Spenserworlds”? 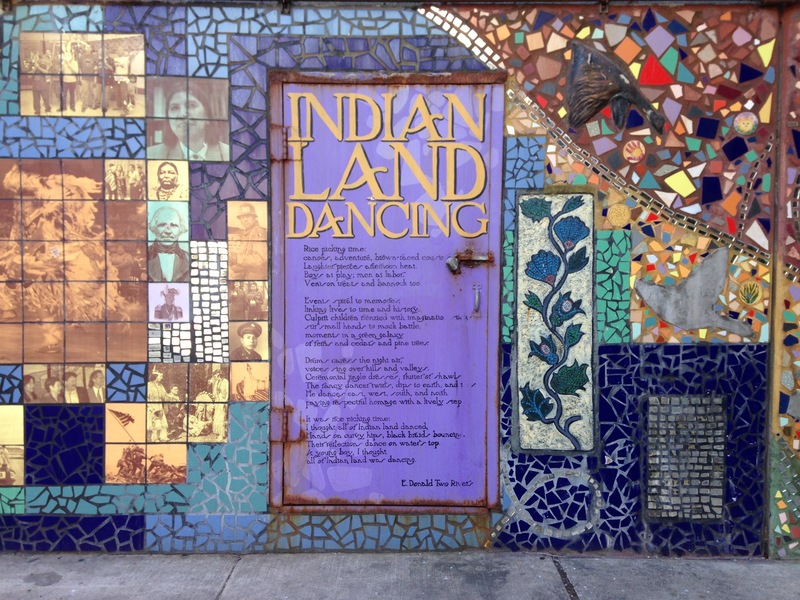 Working on Native American literary studies, Kelly Wisecup discusses the use of digital mapping and archiving platforms in the classroom and how they might be used to engage with literary studies and museum studies. How might digital resources be incorporated into place-based teaching? The meeting will feature short presentations followed by a discussion. 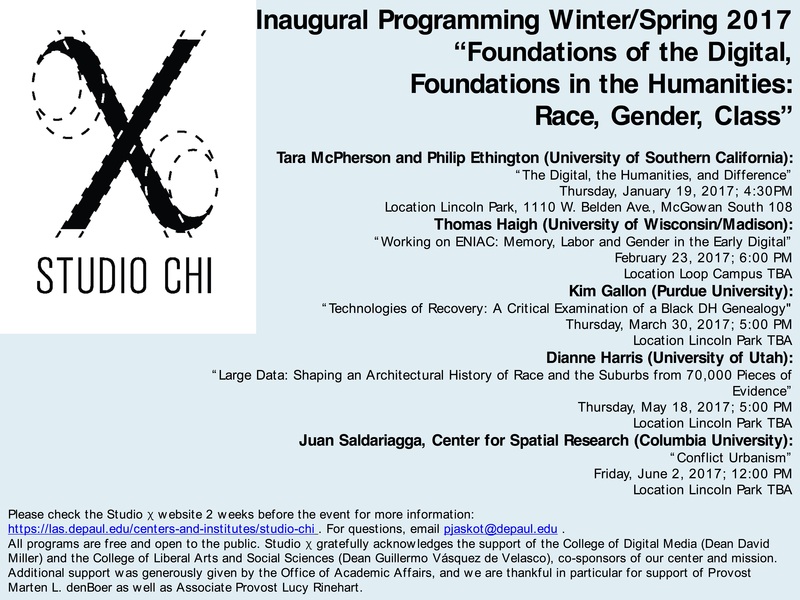 All welcome regardless of digital humanities experience. Refreshments provided. Questions? Contact NUDHL co-convener Jillana Enteen, j-enteen@northwestern.edu, or visit nudhl.net. 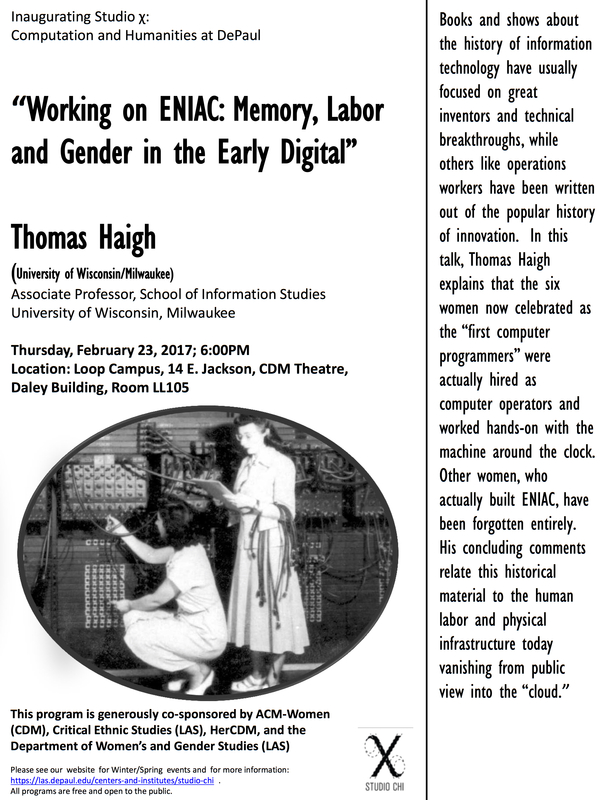 Studio CHI will be hosting a talk later this month featuring Thomas Haigh. Please consider checking us out and posting the attached flyer to spread the word! 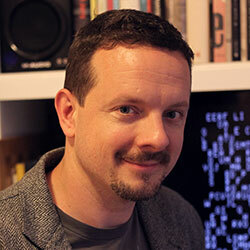 The EECS Department welcomes Prof. Nick Montfort, Professor of Digital Media, MIT. Montfort will present a talk entitled “TBA”, on Monday, December 5 at 10:00 AM in Tech Room L440. 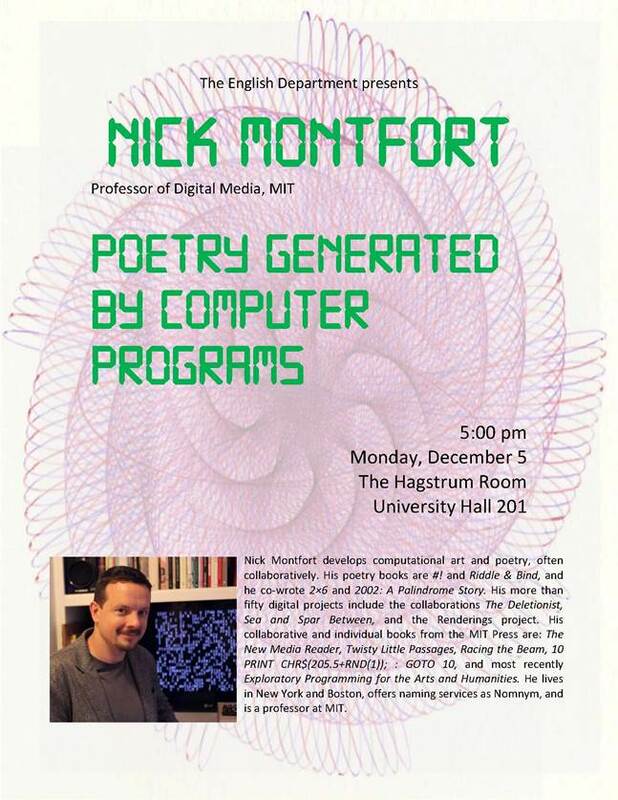 Bio: Prof. Nick Montfort develops computational art and poetry, often collaboratively. He is a professor at MIT and is the principal of the naming firm Nomnym. He lives in New York and Boston. Montfort earned a Ph.D. in computer and information science from the University of Pennsylvania, a Masters in creative writing (poetry) from Boston University, a Masters in media arts and sciences from MIT, and undergraduate degrees in liberal arts and computer science from the University of Texas. Projects of Montfort’s include several very small-scale poetry generators such as the ones in the ppg256 series and Concrete Perl; the group blog Grand Text Auto; Ream, a 500-page poem written in one day; Mystery House Taken Over, a collaborative “occupation” of a classic game; Implementation, a co-written novel on stickers documented in a book; the interactive fictions Winchester’s Nightmare, Ad Verbum, and Book and Volume; and several other work of digital poetry and art, including the collaborations Sea and Spar Between (with Stephanie Strickland) and The Deletionist (with Amaranth Borsuk and Jesper Juul). Montfort works in several different contexts, which include the Web, book publication, and the literary reading but also the demoscene (e.g., the collaboration Nanowatt, shown at Récursion in Montréal) and gallery exhibition (e.g, From the Tables of My Memorie, exhibited in Boston and Singapore and the collaborative Boston exhibit Programs at an Exhibition). He translates computational art and writing and organizing the translation project Renderings; his own work has been translated into half a dozen languages. For instance, his free-software computer-generated novel World Clock was translated to Polish and published in ha!art’s Liberatura series, which also includes Finnegans Wake. Many of Montfort’s works have also been modified and transformed by others to become the basis for new work; his short generator Taroko Gorge has been the basis for more than two dozen published remixes. Be sure to join us this Friday as we inaugurate the brand new home of the Multimedia Learning Center in Kresge Hall. We’ve reimagined what an interdisciplinary facility for student learning, scholarship and collaboration can be—and we can’t wait to show it you. Northwestern faculty, staff, and affiliates are all welcome. Can’t make it to our main event? Drop by for a special tour the day before, Thursday, October 13, 2016 2-5pm. With a nod to both this year’s One Book, One Northwestern selection, “The Signal and The Noise” by Nate Silver, and Weinberg’s recently announced interdisciplinary strategy of “Data, Culture, and Nature”, the MMLC is offering a series of workshops to look at topics of data organization, visualization, and analysis. All faculty, graduate students, and staff are welcome. “The Story of Data”— Why do we always use tables to organize information? What’s lost? What’s gained? 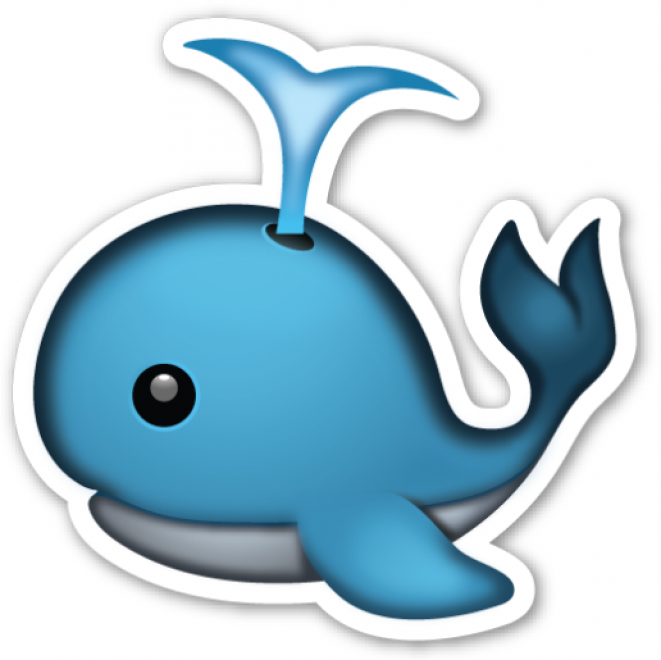 “Seeing Data” — We can make charts, graphs and maps to “see” data. But is seeing believing? “Correlation vs. Causality” — We know they’re not the always the same, but when are they equal? Now is the time to apply for HASTAC Scholars, or encourage your students to apply! The application period closes on October 15. Please apply here or share this link with interested colleagues and students: bit.ly/apply-to-hastac-scholars. Beginning this year, Scholars will be admitted for a two-year cycle. During their second year, Scholars will be encouraged to take on greater leadership and peer mentoring roles. We think that this extended timeline will go a long way toward building peer mentorship structures and keeping consistent activity and energy on the site year-round. Please don’t hesitate to email us with any questions at scholars@hastac.org. Please join the Ordinary Media Workshop this Wednesday 10/12 at 4pm in the seminar room of the Alice Kaplan Institute for the Humanities in Kresge Hall. Patrick Jagoda is Associate Professor of English and Cinema & Media Studies at the University of Chicago. 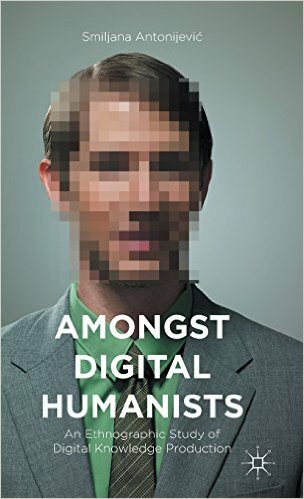 He specializes in media studies, 20th and 21st-century American literature, and digital game theory and design. He is the author of Network Aesthetics (U Chicago Press, 2016) and co-author of The Game Worlds of Jason Rohrer (MIT, 2016). He is co-founder of the Game Changer Chicago Design Lab and serves as co-editor of Critical Inquiry. Smiljana Antonijević Ubois, PhD, explores the intersection of communication, culture, and technology through research and teaching in the U.S. and Europe. Smiljana’s most recent publications include “Developing Research Tools via Voices from the Field” (ACRL, 2016), Amongst Digital Humanists: An Ethnographic Study of Digital Knowledge Production (Palgrave Macmillan, 2015), “Personal Library Curation” (The John Hopkins University Press, 2014), and “Working in Virtual Knowledge” (MIT Press, 2013). Her latest research projects are Digital Scholarly Workflow, the Pennsylvania State University; Alfalab: eHumanities Tools and Resources, Royal Netherlands Academy of Arts and Sciences (KNAW); Digitizing Words of Power, University of Amsterdam; and Humanities Information Practices, a collaboration of the KNAW, Oxford Internet Institute, and University College London. For more information see www.smiljana.org. 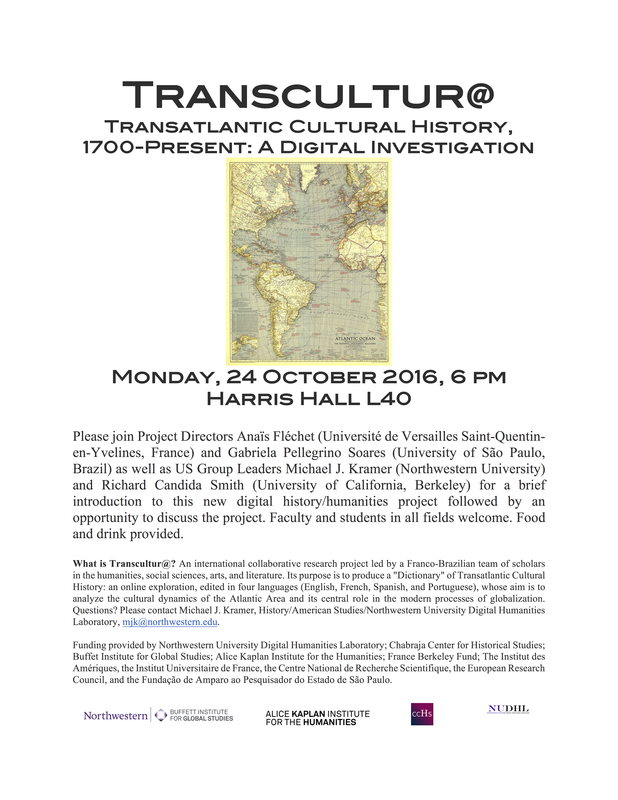 All welcome regardless of digital humanities experience. Coffee and snacks provided. Questions? 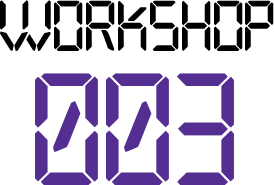 Contact NUDHL co-convener Michael Kramer, mjk@northwestern.edu or visit nudhl.net.